Buy Three Get Two Free! 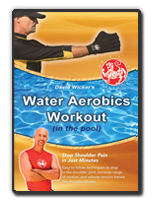 Finally a DVD that explains exactly how to perform each water fitness exercise correctly for maximum safety and results. David Wicker shows you the name of each exercise, the proper form of each exercise, the specific muscles you are working and how to modify the moves if you have injuries. Part one breaks down the moves step by step and in part two the water fitness workout is done in real time so you can see how all the exercises flow together and you can even follow along with the workout if you’re in the pool. This is the most effective and professional water aerobics workout in the pool ever made. You will see noticeable results from this workout even if you’ve done water aerobics for years. You will also need White Tiger Water Fitness Gloves and White Tiger Water Fitness Shoes to use with this DVD. Also recommended is our White Tiger Water Fitness shirts, hats, and backpack. Stop shoulder pain in just minutes a day. Easy to follow techniques to stop pain in the shoulder joint, increase range of motion and release tension between the shoulder blades. Simple exercises to relieve pain in the shoulder joint from shoulder bursitis, shoulder tendonitis, impingement syndrome, rotator cuff tears, shoulder spurs, etc. Rehab exercises beyond physical therapy to fix, help, stop, and end shoulder pain in just minutes a day. 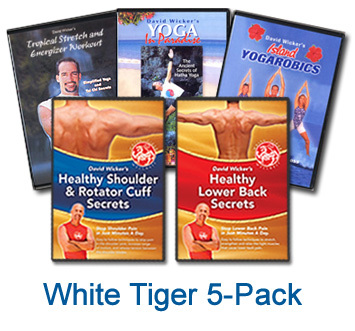 The DVD, Healthy Shoulder and Rotator Cuff Secrets by White Tiger Wellness Guru David Wicker reveals 30 Minutes of the absolute clearest and easy to follow exercises to achieve and maintaining a happy and healthy shoulder joint for golf, tennis, weight lifting, swimming, baseball, football and daily life. Specifically made to be used with it's companion DVD Healthy Lower Back Secrets. These lower back pain relieving exercises will not only reduce back pain, but stop back pain, and even fix back pain for good by releasing the tight muscles around the hips that attach to the lower back, including the glutes, hamstrings, calves, IT band, hip flexors, piriformis (syndrome), and the sciatic nerve that causes sciatica. This DVD will also strengthen the weak muscles of the stomach, obliques and base of the spine to help support a healthy lower back. 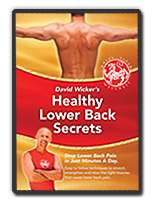 The DVD, Healthy Lower Back Secrets by White Tiger Wellness Guru David Wicker goes beyond rehab from physical therapy to reveal 30 Minutes of the absolute clearest and easy to follow exercises to achieve and maintain a healthy Lower Back for golf, tennis, weight lifting, swimming, baseball, football and daily life. 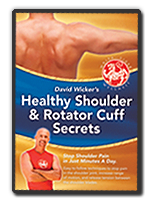 Specifically made to be used with it's companion DVD Healthy Shoulder and Rotator Cuff Secrets. This is the perfect introduction to White Tiger Yoga, a contemporary Yoga Style that combines flowing movements from Tai Chi with Traditional Yoga postures. White Tiger Yoga is distinctly different from hatha yoga, bikram yoga, astanga yoga, power yoga, or iyengar yoga because people with asthma, fibromyalgia, arthritis, back-pain, and headaches have completed this program and stayed with it for years. Older and overweight people find this to be the most sustainable program they've ever done! The Tropical Stretch and Energizer is the perfect introduction to White Tiger Yoga and the holistic arts. On your journey to finding life-balance, this DVD will be your trusty guide. 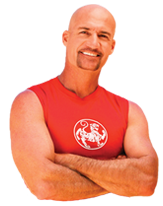 Featuring White Tiger Wellness Guru David Wicker on the Big Island of Hawaii. Also great for golf, tennis, weight lifting and just plain daily life! Money Back Guarantee. Yoga in Paradise reveals the most powerful secrets of White Tiger Yoga ever seen on DVD. With this 45-minute DVD you will eliminate stress from every cell of your entire body. Yoga in Paradise will stretch and release tension from your arms, legs, and back so you will emerge with a beautifully lean and toned appearance. White Tiger Yoga is a unique yoga style distinctly different from hatha yoga, bikram yoga, astanga yoga, power yoga, or iyengar yoga because it will reverse chronic frustration, worry, and insomnia with special breathing techniques and more. This DVD is a must for anyone seeking the many benefits of yoga. Featuring White Tiger Wellness Guru David Wicker on the Big Island of Hawaii. Also great for golfing, playing tennis, lifting weights, swimming and just plain daily life. Money Back Guarantee. White Tiger Yoga with an aerobic twist for Weight Loss and Muscle Tone. White Tiger Yoga is a unique yoga style distinctly different from hatha yoga, bikram yoga, astanga yoga, power yoga, or iyengar yoga because you will move in large fluid movements used in the Chinese martial arts like Tai Chi, to achieve incredible balance, toned muscles, and inner calm. This gentle program is low impact on the body and also uses static White Tiger Yoga postures. Make no mistake -- Island Yogarobics will transform your body into a very pleasing shape! You will receive 40-minutes of soft-style martial art movements from Tai Chi followed by 20-minutes of yoga. Featuring White Tiger Wellness Guru David Wicker on the Big Island of Hawaii. Also great for golfers, tennis players, swimmers, baseball players, football players, kids, and you too! Money Back Guarantee.